CD review: "Life in the First Person"
This review first appeared in the February 23, 1996 issue of the North County Times. Alison Pipitone writes songs with a wisdom we tend to associate with longevity. Listen to her opening words (I'm calm and collected/hurtful and neglected/bankrupt and idle/well, I don't try sometimes) and you'd not guess this is the debut recording of a woman in her mid-20s. 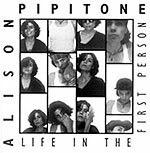 Unlike so much of what passes as socially aware or protest music these days, Pipitone is able to point out both society's hypocrisies and our own innate ability to lie and blame our own failings on anything but ourselves. Liberal idealism matched with a call to personal responsibility? Hell, if she ever wants to lay down her guitar she can run for office and give the Demopublicans a lesson a true reform. But we digress. Pipitone's music is what gives her lyrics their power. Hard-edged and contemporary, her music is along the lines of Sheryl Crow or Joan Osborne. Like Crow, Pipitone's rough, nasal vocals are half-sung, half-spoken. And she also plays some mean guitar. Then there's this: While practically unknown compared to Crow or Osborne, truth is she writes better songs than either. The track "New House Day (The Jealous Song)" is a typical Pipitone composition  great hook-laden melody that'll get stuck in your head; funky, rhythmic acoustic guitar; and lyrics both ironic and hopeful.